Ed Sheeran was acting as peacemaker for Harry Styles and Taylor Swift when the pair had a reportedly "awkward" meeting after the MTV Video Music Awards. 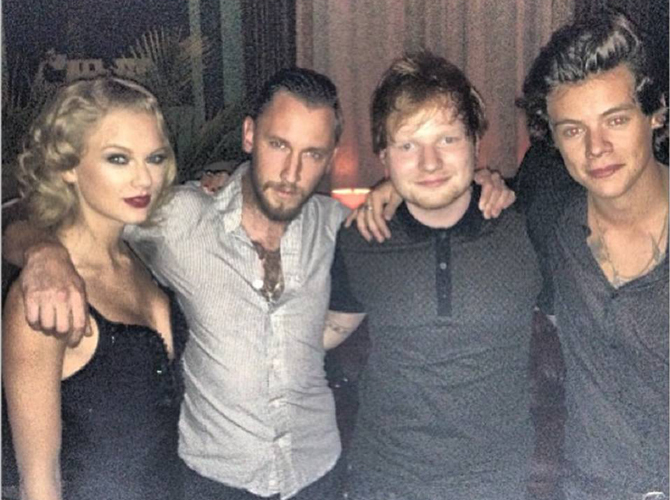 Ed Sheeran kept the peace between Harry Styles and Taylor Swift at the MTV Video Music Awards. After the "22" hitmaker appeared to badmouth the One Direction heartthrob when the band was on stage at the ceremony on Sunday (August 25, 2013), the former couple was seen together, along with Ed and party promoter DJ Spiky Phil, and it is said the meeting wasn't easy for anyone involved. Taylor, 23, was seen on screen seemingly mouthing "shut the f**k up" as the "Best Song Ever" quintet was presenting an award and according to Us Magazine, things were "super awkward" later in the evening with the "Lego House" singer stuck in the middle. Harry's band mates leaped to his defense after Taylor also appeared to dedicate her own Best Female Video trophy for "I Knew You Were Trouble" to her ex-boyfriend, whom she has admitted she wrote the song about. Liam Payne previously said: "I just thought it was a bit not needed. I mean, you just won an award, it's like, concentrate on yourself... Hashtag get over it."